So, I know a lot of people struggle with their weight and their body image; me, being one of them. Before I tell you about the program I use, I should say that no matter your body size or shape, you are a beautiful, valid human being and you should only ever strive to change yourself for you. Only you. So the program I use, I am sure everyone has seen the infomercials for; it’s Focus T25 by Beachbody. If you ever wondered if it worked, or if it was worth the money, it is! 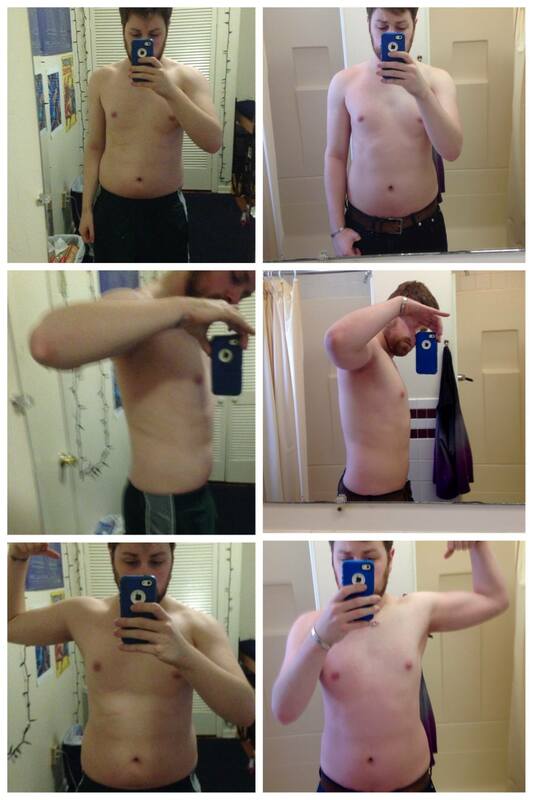 Below are pictures of results from the last time I went through the program. Not that I was ever super overweight but, you can see real progress there, and as I type, I am looking even better today! That was even without dieting even in the slightest, so, I can only imagine what I would look like if I had followed it as strictly as I was supposed to. There are a lot of diet supplements and drinks that I want to try but haven’t had the money for, namely their workout drink, Shakeology. There is also another level of the workout called Gamma Cycle that really steps it up to make you really much more cut and burn the rest of the fat off of you that you might have left. I really suggest it if you are looking to get fit because, there is a low impact modifier in case you have a bad knee or need to take it down just a little if you need to get a bit stronger before you go all out. Also, even though it is high intensity, it’s also only 25 minutes so, for people who are busy like me can easily fit a workout into their day without having to go to the gym. I do warn that it is very intense and you should really read the disclaimers attached to it about your health. Listen to your body and don’t push yourself too far, you will get stronger. Mostly you have to be patient, too. You get encouraging results but not everyone gets a ripped, lean body from the first time through the program. I am almost done with my second run through and I am still not completely where I want to be! Keep at it! All characters, products, and images are copyright of their original owners.